This is a multiple consumer situation because node “noSocks” and “all” both consume node “salesOrders”. In these multiple consumer situations filters are not pushed-down per default because a filter even though only defined on one consumer would affect both consumers. The inputs from nodes “noSocks” and “all” are combined in a Union and routed to the Semantics node. Therefore, ARTICLEs arrive at the output via two ways: via node “noSocks” and via node “all”. 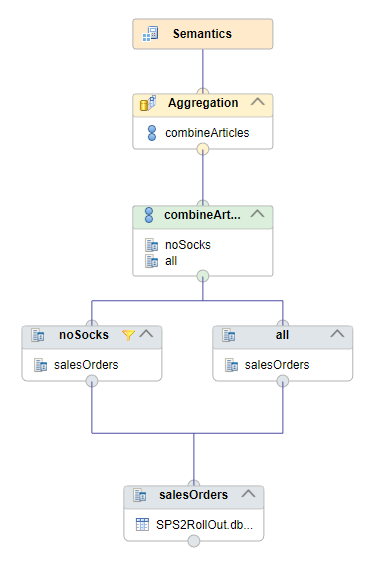 In the default situation, when the filter on node “noSocks” is not pushed-down to “salesOrders” ARTICLES with value “socks” will arrive at the output via node “all”. See below for a screenshot of the results. 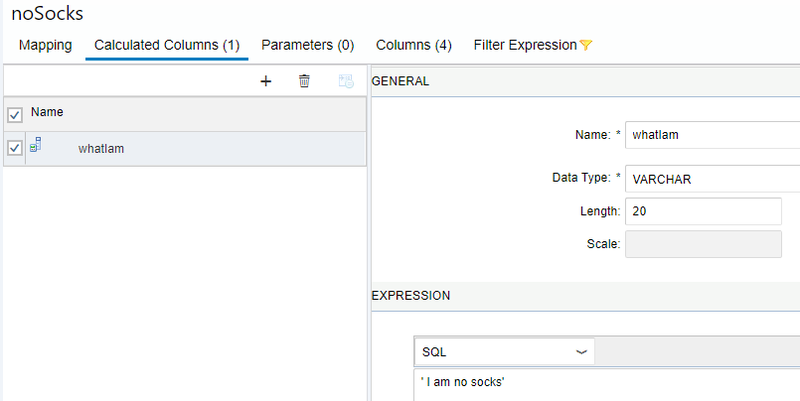 The routes that have been taken by a record can be identified by the calculated column “whatIam” which shows that “socks” records arrive via node “all” only. Other ARTICLEs than “socks” arrive via two routes and therefore appear twice in the output. Next, we will check flag “Ignore Multiple Outputs For Filter” in node “salesOrders”. Therefore, in this case different results are obtained depending on whether filter push-down is enforced or not. Both results are correct given the modeling. It is up to the developer to decide which behavior is intended.